The Bayou Fitness adjustable dumbbells are a high-quality set designed with durability in mind, made from chrome plated steel, this heavy-duty pair really look the part, but with so many other excellent adjustable dumbbells on the market right now, will this steel pair be able to cut it against the might of the Bowflex and Powerblocks? In this review, we’ll take a detailed look at the Bayou 50 lb dumbbells and see if there is anything that sets this pair of dumbbells apart from the rest of the bunch. A quick look at the product description first. And for those of you in a rush don’t forget to take a look at our comparison table at the end of the article where we compare the Bayou fitness pair against their two closest rivals. Bayou Fitness has a long established reputation for high-quality gym gear, from total fitness home gyms to adjustable dumbbells. With affordable prices to boast, Bayou fitness are cutting themselves a nice slice of the cake in the home gym equipment market. A reputable company that can be trusted, they receive high ratings from customer reviews. Fast, simple and foolproof, sum up the design of the Bayou Fitness adjustment system. You simply lift the pin up and slide it into the position of the desired amount of weight, the pin will then lock into place. On the negative, the Bayou 50lb set adjusts in 10lb increments, 10lb increments will be problematic for isolation exercises where it is preferable to increase weight in smaller increments, this is the first set I have reviewed where the dumbbell increases in such large increments. Is it a deal breaker? Maybe, even 5lb increments for some isolation exercises can be too heavy, which is why companies like Bowflex and Powerblock have their sets adjust in 2.5lb increments resulting in a much more versatile dumbbell. But there is a solution, it’s not ideal but it’s something many people who bought the 50lb Bayou set have had to do. If you want to adjust the dumbbell in 5lb increments you can adjust just the one side of the dumbbell. Although this option does leave an unevenly distributed dumbbell, it is workable, and if you need the 5lb increments it’s your only choice. Something often overlooked by people when choosing their first set of adjustable dumbbells is the actual length of the dumbbell handles. Ideally, you want a handle which is as compact as possible, the closer we can get to the feel of a fixed weight dumbbell the better, longer handles can prove awkward to train with and can clash when overhead pressing. Just like the Bowflex, the handles of the Bayou Fitness dumbbells are long, this is because of their adjustment systems which run the whole length of the handle, the downside to this is, even if you’re training with the lowest weight possible the handle will remain the same length as training with 50lb. What serious lifters look for from an adjustable set is a dumbbell handle that only increases in length as the weight increases, this helps keep the dumbbell compact which will aid correct form and give you the feel of a fixed weight dumbbell. Powerblock and Corefitness adjustable systems both allow for a dumbbell which only increases in length as the extra weight is added. What stands out about this set of dumbbells is the build quality, chromed steel plates and minimal plastic in the design will make this set of dumbbells durable, it’s nice to see an adjustable dumbbell set which doesn’t incorporate a lot of plastic, if you take a look at the Bowflex 552’s you will notice a plastic coating around the dumbbells plates. Plastic encasing the plates leads to a fragile dumbbell, it’s almost unavoidable at some point you going to drop a dumbbell and if you have a set of Bowflex it’s highly likely a drop will result in a break of the plastic surrounding the weight plates. Whilst we do not recommend dropping any adjustable dumbbells, the design and build quality of the Bayou Fitness pair looks like they will take a few drops without any problems, so for durability, the Bayo fitness wins hands down against the Bowflex and similar plastic coated dumbbells. 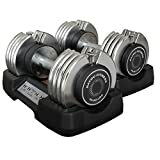 I’ve chosen two of the best adjustable dumbbells on the market right now, this will help you compare the Bayo Fitness dumbbells to the two top-ranked dumbbells available in the same priced bracket. Currently my top pick for an adjustable dumbbell pair, there really isn’t any adjustable dumbbell out there that can challenge the Powerblock Elite series. The Powerblocks are available in 50 – 70 – 90lb sets but what’s great about the Elite range are their expansion packs. 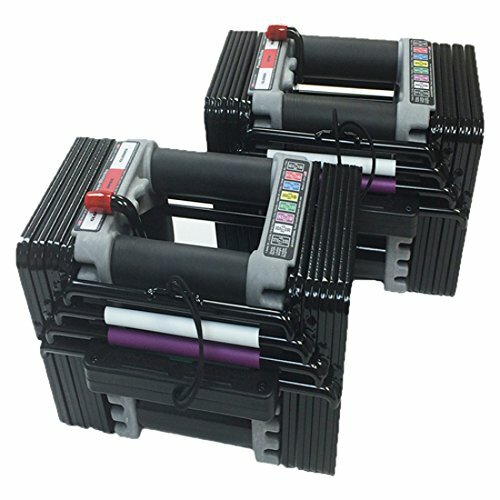 Let’s say you bought the 50lb set and a year or two later your strength has increased so much so that you need a heavier dumbbell, what you can do now is simply buy one of Powerblocks expansion packs, much more affordable than having to pay out for a whole new set of heavier dumbbells. The Elites are also pretty fast to adjust, to adjust the Powerblock you use a magnetic selector pin, the pin lets you quickly adjust in 5lb increments, but what sets these dumbbells apart from most sets is the option of being able to adjust the dumbbells in 2.5lb increments. To adjust in 2.5lb increments there’s a little 2.5lb cylinder, which you place inside the handle, giving you the 2.5lb increment, ok it takes up a few more seconds in adjustment time, but having this valuable option for isolation exercises is a massive help. And lastly, because the Powerblocks use a stacking system for the weights, it allows for a compact dumbbell, by this I mean the length of the dumbbell only increases when more weight is added. Big thumbs up! A top set of adjustable dumbbells, worth every penny. By far the most popular set of adjustable dumbbells you can get your hands on at the moment, why? The rep! 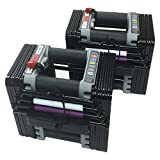 Bowflex has one of the best reputations out of all the home fitness companies, if you buy a Bowflex product you expect quality and that’s just what you get with the Bowflex 552 pair. It’s not all about rep though, the Bowflex 552 dumbbells were the first adjustable set to use the Select-Tech adjustments system, a super fast adjustment system that allows you to choose your desired weight with a turn of a dial, a fast easy to use no fuss adjustment system. Are they any good? Yes if you want fast adjustment times and a quality build, but they do have their drawbacks, firstly just like the Bayou Fitnesses dumbbells the handles are of fixed length, this means whatever weight you choose the handle length will be the same. 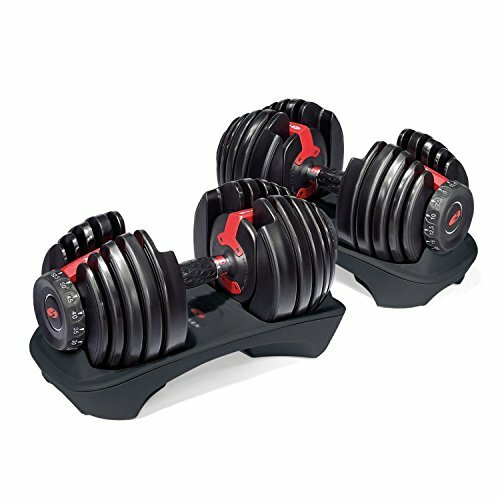 There’s no expansion packs available for the Bowflex adjustable pair, 52.5lbs per dumbbell is the maximum weight, this limits them to beginner and intermediate weightlifters, which is absolutely fine if you do not envisage yourself lifting heavier than this in the future and not many will, a 50lb a dumbbell is hefty and only serious lifters will need more. And lastly the weight plates are enclosed in a thin plastic layer if you’re careful this shouldn’t be an issue, but as mentioned earlier because of the nature of weight training it’s very easy to drop a dumbbell, cracked weight plate casing is a well-documented issue with the Bowflex pair. Adjustable in 2.5lb increments up to 25lb and 5lb thereafter is nice to see, making the Bowflex pair a more versatile option compared to the Bayou fitness set. Overall a great set of dumbbells for home use, just don’t go throwing them around! Summary What sells the Bayou Fitness set is their durability, chromed steel plates will save you the worry of breaking anything from a drop. The less plastic used the better for adjustable dumbbells, which is where the Bayou set beats the Bowflex pair hands down. The only real negative I can see with this set is the 10lb increments, if you can get past this, the Bayou Fitness pair should be worthy of some serious consideration. Bowflex SelectTech 5.1 Adjustable Bench Review – With Video!